We’re raising animals on pasture. Our practices reflect our love of raising animals. We rotate animals to fresh grass regularly. We don’t use antibiotics or hormones to boost their growth. Our feed is GMO-free. We make sure everyone has plenty of room to socialize and enjoy the sunshine. We graze rotationally, which builds soil health. 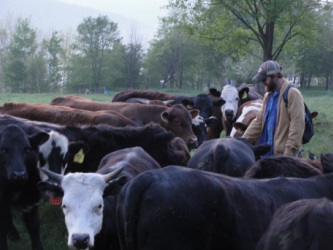 Raising animals on pasture requires that we spend a lot of time out in the field – but for us, that’s the point and the joy of small-scale farming. We’re selling meat locally. Our goal is to feed our family, our friends, and our neighbors. We like that good food brings people together. We hope that our food will give you plenty of excuses to gather round the table (or the bbq, or the picnic blanket) and chow down. We’d like to show you around the farm. We imagine you might have some questions about how we raise our animals or sell our food. Feel free to write or call with questions. Better yet, contact us to find a time to visit Nightfall. We can show you around the farm, so you can get to know the place and our practices in more detail.